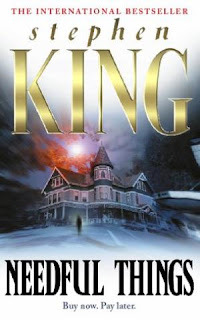 I decided not to wait quite so long to take a crack at another Stephen King novel as I did for Hearts in Atlantis, and quite the understated one I decided on. Needful Things isn't really one of King's books that is mentioned terribly often, but I picked it up over some of his more famous offerings as the premise really struck me as interesting. I know, that has lead to some... less than successful ventures for me in the recent past, but my track record with King's novels has been pretty good so far. What could it hurt? At the beginning of Needful Things, Castle Rock is more or less your average small American town. A few weird things have happened there in the recent past, but not so hugely weird that most of the townspeople would notice. Then a new shop opens up in the business quarter. Nobody can quite tell what it sells, Needful Things being something of an obtuse name at best, but everyone is intrigued by it in only the way that small things can be fascinating to the population of a small town. When it does finally open, people are quite taken with the vendor, a Mr Leland Gaunt, and his shop proves to sell all kinds of interesting items, all things that people desperately want. And he sells them just within his customer's budget, an added bonus almost. It's only when old tensions start to intensify that the true price of said items come to light. I do love a slow burner sometimes, and after a string of quick reads, it was nice to sit back and let Needful Things work its way under my skin. When you have this sort of story-line, where a lot depends on the slow build of conflict and tension, there are two primary things that you have to get right. First, there's the basis for conflict within the cast of townspeople and the way that those grudges are exploited. There is quite admirable work on show here: mud thrown at the sheets of the woman who pretty much lives to be angry at her neighbours, spreading incriminating letters and "evidence" to sow the seeds of doubt in the lives of loving couples, and escalating what was already a bitter and petty argument between the congregations of the local Baptist and Catholic churches. Secondly, and inescapably tied to the first point, is the identity of the person masterminding the whole bloody affair. Enter Mr Gaunt, a devil figure who is, for the most part, much more subtle than Randall Flagg from The Stand. I think I kind of prefer this version of the Devil in King's work, because, while I love The Stand, I did always wonder what really attracted people to someone as creepy as Flagg. In contrast, Gaunt is just the right mix of utterly charming and completely malign. There's so much power that he could use to much flashier effect, but doesn't because it's so much more interesting to just nudge people into indulging the worst parts of their character. With these two aspects, the tension ramps up to some truly impressive heights, and that's saying something considering that my favourite character is killed off probably less than halfway through the novel. What stops it from being my current joint favourite King novel along with The Stand is the ending. All the mind-games that Gaunt has been playing on the town are in their final stages, people are dying left, right and centre. And then the heroes have their bittersweet victory after the intervention of a completely unexplained deus-ex-machina. It is seriously frustrating to have your main hero, a sheriff who until now was normal if decidedly more observant and slower to jump to conclusions than the rest of the town, suddenly develop powers that he had previously shown no signs of. Not cool. I'd have settled for a moral victory, have the heroes lose the fight but retain their dignity and souls, just so long as the magic hand-waving could be avoided.